Conti Solar, a national solar engineering, procurement and construction (EPC), O&M and energy storage company, announced today that it provided full EPC services for the 4.0 MW (DC) landfill solar project located in Cuyahoga County, Ohio recently named 2018 Gold Project of the Year by Solar Builder Magazine. The project is also the largest landfill solar project in Ohio. In addition to landfill, Conti Solar’s industry expertise spans across the market segments of large-scale solar projects. Conti Solar worked with IGS Solar, the project developer and completed the project in July of this year. While landfill projects introduce more complexities in the design and construction of the solar system, they also bring great rewards. Building solar on landfills converts the unproductive area to a carbon-free solar power generation plant. Cuyahoga County gained jobs; lower-cost energy; retail, lease and tax revenues; and a healthier environment for the community. “Conti Solar is pleased the Cuyahoga County Landfill Solar Project has been honored with this award. This project signifies the will of the county to work through challenges and add low-cost, renewable energy to their portfolio. Congratulations on this major accomplishment. We hope more will follow,” said Eric Millard, Chief Commercial Officer of Conti Solar. 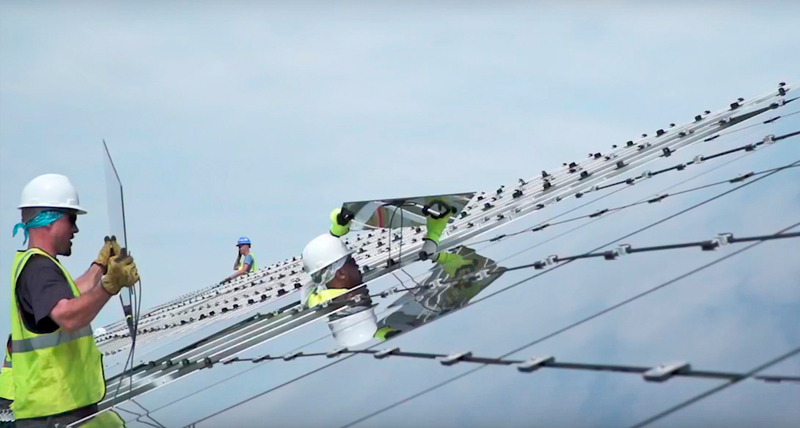 “With a reputation of extensive experience and reliable execution, Conti Solar delivered on this project working with impeccable execution,” commented Mike Foley, Director of Sustainability, Cuyahoga County. The Cuyahoga Landfill Solar Project is installed with 35,520 solar modules, 1,976 posts, 988 ballast blocks, 26 rows of racks and two central inverters. The project took four months to complete and the power generation is contracted with the county via a 10-year power purchase agreement with an option for another 10 years and the opportunity to purchase the system after six years. Watch the Conti Solar Cuyahoga Project Video at https://youtu.be/CLA2x_jtHkk.